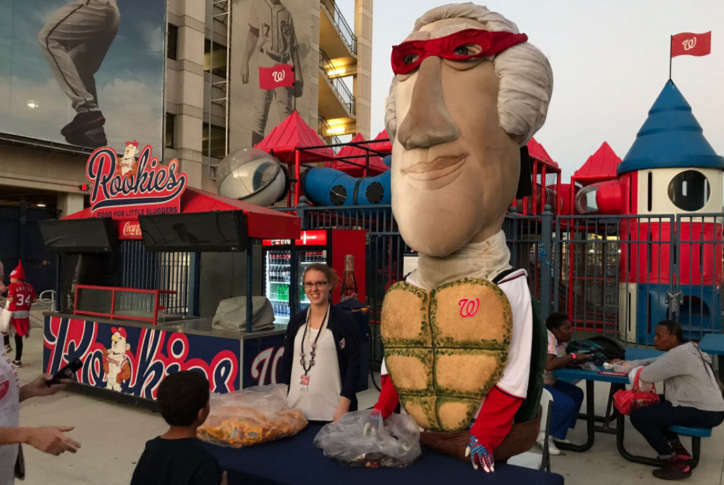 Just a few days before taking on the Cubs in the National League Divisional Series, the Washington Nationals held a "Haunted Pep Rally" at Nationals Park. WASHINGTON — With the Nationals headed for the playoffs and Halloween just around the corner, the team hosted a free “Haunted Pep Rally” Wednesday night at Nationals Park. Several racing presidents dressed up in Halloween costumes to hand out candy to kids wearing costumes. Teddy Roosevelt went as Chewbacca from “Star Wars,” and George Washington dressed as a Teenage Mutant Ninja Turtle complete with a mask and shell. There was also a “Zombie Zone,” where Nationals fans dared to dodge creepy zombie fans of other teams. The Nationals host the Chicago Cubs in game 1 of the National League Division Series Friday, and fans at the pep rally shared their predictions. Ken Millstone said the Nationals’ pitching is sharper this year and the team feels special, but he’s cautious. Holly Goers believes the Nationals can get past the Cubs, but it might take all five games. “Our players are healthy coming into it; we know we’ve got strong backups. I feel really confident this year,” Goers said. She predicts the Nats will face the Astros in the World Series.